PORT OF VIRGINIA: Increasing vessel sizes are the driver of the terminal expansion and channel dredging projects. Loaded import and export volumes were up 8.6 percent and about one percent, respectively, at POV in 2017. The Port of Virginia saw the number of import vehicles at Newport News Marine Terminal jump 22.5 percent in 2017. The number of ships calling Virginia dropped by nine percent in 2017. The Port of Virginia set a new annual record for container cargo volume having handled more than 2.84 TEU, a seven-percent increase over last year’s total. In 2017, loaded import and export volumes were up 8.6 percent and about one percent, respectively, over the prior year. The port saw increases in TEUs, truck volume, rail volume and total volume at Richmond Marine Terminal (RMT), the port’s growing barge terminal on the James River. The port also saw the number of new import vehicles at Newport News Marine Terminal jump 22.5 percent. “In 2017, we moved 185,000 more TEUs than we did in 2016, which until now, was our highest volume year on record,” said John F. Reinhart, CEO and executive director of the Virginia Port Authority. “For calendar 2017, we had a perfect streak with every month setting a new month-record, bringing us to a new annual record and did this while undertaking the largest infrastructure project in the port’s history. The number of ships calling Virginia dropped by nine percent in 2017. Fewer ships, but bigger in size with increasing cargo loads is a trend that was expected and one that will continue, Reinhart said. The increasing vessel sizes are the driver of the terminal expansion projects and larger effort to dredge the Norfolk Harbor to 55 feet and widen its in- and out-bound commercial navigation channels. December is the half-way mark in fiscal year 2018 and thus far TEU volumes are 1,456,234 TEUs, which is an increase of 5.7 percent when compared with the same period last fiscal year; gate volumes were 514,097 moves, up 9 percent; and loaded imports and exports are up 8.4 percent and 5.7 percent, respectively. The calendar year was completed with December’s TEU volumes of 237,525 TEUs, an increase of 3.4 percent when compared with last December. Also in December, rail volume was up nearly 4 percent; RMT volume up 5 percent; motor-carrier volume up 3.5 percent; and breakbulk tonnage up 5.6 percent. In other ports accomplishments in 2017,the port’s double-stack rail capacity expanded in January as CSX completed its National Gateway project, opening up important markets in Pittsburgh and northeast Ohio. In February, work began on the $320-million expansion at VIG, a project that will nearly double the terminal’s annual container throughput capacity to 1.2 million units. 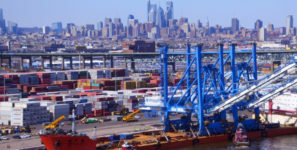 The US government approved the East Coast Gateway Terminal Agreement in April, allowing the ports of Georgia and Virginia to begin information-sharing and collaboration in certain areas. The goal of the agreement is to make Georgia and Virginia preferred East Coast export-import gateways. The port opened its 26-lane, $42 million technology-driven North Gate complex at Norfolk International Terminals in June. The gate was coupled in December with the I-564 Intermodal Connector to give truckers direct interstate access. In October, Virginia joined a pilot designed to import fresh fruit to US East Coast ports from South America. The pilot allows entry of in-transit, cold-treated containers of agricultural products from Peru, Uruguay and Argentina. In November, the US Army Corps of Engineers recommended deepening the Norfolk Harbor and entrance channels to 55 feet and widening portions of the Thimble Shoals Channel to 1,200 feet. Both recommendations were made based on future forecasts of larger vessels calling on The Port of Virginia.